Music has obviously played an important role inworship in St. Nicholas Church throughout its history. There is evidence that a choir under the leadership of Miss Andrew (the first Organist) was in existence from the earliest days, and we may assume that, prior to the completion of the organ, congregational praise was led from a harmonium. 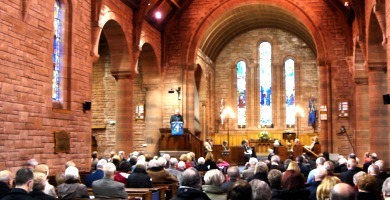 It must have been the hope of Peter Macgregor Chalmers, architect of the building, that at some point an organ would be installed, space having been created for it between the Chancel and the (old) Vestry. That dream came nearer fruition when, on 3rd October 1909, the Minister was in a position to announce that Mr. Angus of Ladykirk wished to present the congregation of St. Nicholas with a pipe organ and that it was “being built by a well-known firm in England”. In fact this firm of Norman and Beard - later to become Hill, Norman and Beard - built many organs in Scotland and beyond and only ceased to exist in 1997. The organ was designed with considerable care, awareness of the requirements of the building and attention to detail. It was installed during the last weeks of 1909 and dedicated on 6th February 1910. The mechanism of the instrument is housed in the organ chamber which is accessed from the corridor, and the console is - obviously - situated on the north side of the Chancel within a stone arch which displays twenty seven pipes. It consists of two manuals (keyboards) and pedals and has twenty stops. It is interesting to note that until 1958, when an electric blower was installed, the mechanism had been driven by water power. The organ which you hear today is basically the same instrument as it was in 1909, its fine qualities having been conserved by regular care and maintenance. It was completely overhauled - at a cost of £45 - in 1926 and some further renovation work was carried out in 1950. Another major overhaul was undertaken in the late 1980s much of the pipework was dismantled, cleaned and re-assembled with renewed leather. The organ is tuned by a professional organ tuner two or three times each year. The first organist, Miss Andrew resigned in 1913 and Mr. James Spalding was appointed. He fulfilled the duties (with a break for War Service) until February 1950, when Miss Jeannie R.L. Murphy took over. Her tenure continued for over forty years until December 1990, when the present incumbent, Miss Isobel McIlwraith arrived. It is to be hoped that, with the tender loving care it deserves, this fine instrument will continue to serve the people of St. Nicholas for many year to come. 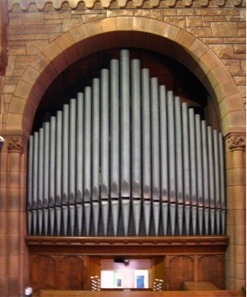 The specification of the 2 Manual and Pedal pipe organ remains unchanged, although the original water power was replaced in the 1950s by the installation of electro-pneumatic action. Manual compass CC to c` 61 notes. Pedal compass CCC to F 30 notes. Six mechanically pre-set combination pedals.